A 5200 SQ. FT. PRIVATE ESTATE HOME LOCATED 6 MILES FROM LAKE VILLACITO IN THE PINE RIVER VALLEY. SURROUNDED BY TOWERING SPRUCE,FIR AND PONDEROSA PINES. 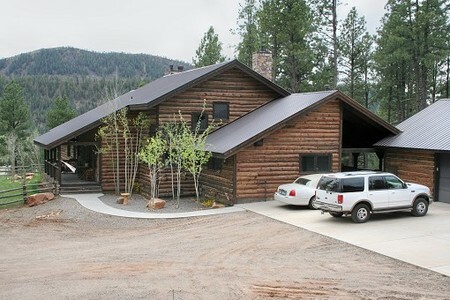 THIS FINE COLORADO LOG LODGE STYLE HOME BOASTS 5 BEDROOMS 4 BATHS AND A 1500 SQ. FT. COVERED PATIO WITH HOT TUB FOR ENJOYING THE BEAUTIFUL COLORADO EVENINGS. THE MAIN LIVING AREAS FOCAL POINT IS THE TOWERING 25 FT. ROCK FIREPLACE WITH BUILT IN ENTERTAINMENT CENTER REACHING UP TO THE EXPOSED TIMBER BEAMED STRUCTURE THAT MAKES UP THE ROOF. THE HOME HAS 3 FIREPLACES AND CUSTOM MADE LIGHT FIXTURES THROUGH OUT.YOU WILL FIND THE OUTDOOR SCREENED IN DINNING AREA A PLUS FOR OUTDOOR ENTERTAINING.